Our menu was inspired by our moms who worked their lives to provide savory foods to us. 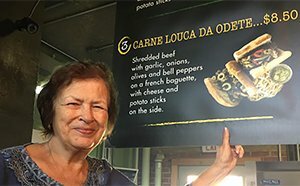 When we decided to open Taste of Brazil we called home to our moms to ask for their recipes. They guided us as we learned how to prepare and cook the foods we loved. Now we bring these tasty cuisines to you. We invite you to stop by and try for yourself the love of Brazil. it’s because you haven’t tried it! Great food and awesome drinks! The staff was very friendly! I will definitely be a repeat customer. My sister and I both loved it. Just tried taste of Brazils food truck and it was delicious. I’m so glad they had gluten-free options. Thank you so much for coming to our back to school event. So wonderful to work with and nothing but awesome reviews by those in attendance! Incredible food sand service! My boyfriend and I go there just about every weekend just to see Molly and taste one of her exquisite concoctions ! Delicious drinks outgoing and friendly people as well as just nice place to hang out. A must go to!! Best Caipirinhas by Molly and the food is AMAZING!! Thanks for coming to our school event last night! The food was great & staff very friendly! I eaten there many times. The food is exceptional and the wait staff friendly. Great experience, awesome food and friendly staff! Perfect place to sit, relax and eat lunch while shopping in the city market!!! The #1 with roast meat is the best!!!! We LOVED working with the Taste of Brazil food truck! Christian was wonderful and the food was AMAZING! Out of over 500 people, there were nothing but compliments about this food truck! Thank you, Christian and staff! I wish I could give it more than 5 stars. Like a home away from home. Molly is the best bartender. Everything on the menu is tasty though I crave the cheese breads. Taste of Brazil is GREAT!! The meals are outstanding!! The cocktails are also reported to be amazing (I will find out soon). And the owners and staff are very friendly and welcoming. This is definitely a 5-Star establishment at reasonable prices that you will want to return to very often. Omg. The cocktails are amazing. The caipirinha and Sao Jorge were to die for. Wish we were hungrier and could’ve tried some of the food, but we had just finished brunch. How ever, we did take a pound of raw picanha home for a reasonable price and cooked it up, topped it with some chimichurri they gave us with the meat…. game changer! Thanks guys!! Food was great and staff was very friendly & helpful. Would recommend & will return to try something new. Super tasty! Very friendly! Excited to come back and try something new on the menu and maybe get a drink to enjoy. The food truck was amazing! Hands down best food truck I’ve had. If near the KC Market, a got to hit place for lunch. Great Food and service. Great food, great service. Ill be back next chance I get. I love this place! I love the people that work here and the food is awesome! Its the perfect place to grab some authentic Brazilian food and drink and relax. Being able to drink coconut water straight from a coconut is the best! I am from New Jersey. Found this little gem while visiting the River Market in Kansas City. Exceptional food and drinks, and our server and hostess, Molly, is extraordinaire!! Will definitely be going there each visit to KC. Great food and atmosphere, definitely a place I will be visiting again! Taste of Brazil Market is a fantastic restaurant. The staff are always very nice, and the coxinha and brigadeiro are both delicious. I highly recommend this restaurant in KC. this is the best I love Taste of Brazil Market! The Coxinha is awesome! They also have Guaraná and many other Brazilian food. Friendly staff, gave a great overview of why Kansas city is a great place to live. Food looked great. Tudo esta delicioso! Tambem recebo Guarana e coxinha! Great food and great family of staff! Come say hello to Molly!! First food truck visit, i tried multiple items and loved all of it! Very friendly people as well! will definitely be looking for them in the KC area!!! Comida muito boa! Um ótimo lugar para tomar a famosa caipirinha brasileira e comer uma coxinha. Super recomendo!!! I Love this place, whenever I am in KC it’s my go to restaurant and bar, great food and amazing atmosphere. Nossa senhora!! Que comida perfeita!! 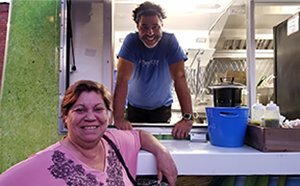 Obrigada pela comida brasileira e por falando em português comigo! Espero que posso voltar em breve. Maravilhoso! Quem quer se sentir em casa deve ir ao Taste of Brazil! Que picanha deliciosa!! We were in KS City for the weekend and stumbled across this food truck on a Sunday morning, and oh my goodness. SO. GOOD. Wish I lived here so I could eat it regularly! Plus the couple that were working the truck were really, really kind. 5 stars! Excellent food, amazing music on Thursday nights, great staff and the passion of Brazil! Excellent place and a must visit in KC! This place is fantastic! Molly is the bomb. Great bartender!! To the friendly bartender who made my excellent caipirinhas and encouraged, rather than rebuking, my habit of eating seared fat with my steak: you are the best and your taste is clearly beyond reproach. The staff is great. The drinks are great. I had the picanha, and that was also great. I only wish I got there earlier, because they were out of a few things. But I will be back for those things, for certain. Thanks again. Food truck visit. Food is delicious! Staff is awesome and friendly. Not a long wait and food is nice and hot. Wonderful food! Super friendly staff and fast service. Price is also great! For the size of the portion, the price is very cheap. Even the products they sell are cheap considering they are all imported from Brazil (especially the guarana). The food is very filling and tastes truly authentic! The pastel and coxinha are delicious, but the passion fruit mousse was the highlight of my night. Definitely a must-try! I’m Brazilian and in love with this place! We love coming here in the River Market! Delicious and authentic food, newly opened bar, and the owners are great. They have a food truck and also a coconut stand out front if that suits you. Highly recommend this place! Came to the City Market and fought the crazy parking JUST to come here. Love, love, LOVED it. We bought an assortment of appetizers loved them all. My husband wasn’t a fan of the fried cheese, Provolone Milanese, due to the strong taste of the cheese but it is perfectly cooked. We will be frequent diners. We both wish we had ordered more of the Coxinha, a cream cheese and chicken fried dough appetizer, and the Chimichurri is outstanding with the Yucca Fries. So good. The only thing wrong with Taste of Brazil is that it is not closer to my house! Molly is always so friendly and helpful and knows how to pour an awesome drink! I love everything on their menu but the Picanha is amazing and so is their chimichurri. We always visit Taste of Brazil when we are at City Market! Great place and the food is awesome! If you haven’t tried Brazilian food, you need to! Location in river market is beautiful. One of the BEST spots in Kansas City!!! Amazing authentic food, blow your mind drinks, and fantastic people watching! It’s my go-to spot for production meetings. Everything is amazing! Even if you’re not adventurous you will love their offerings. Seriously some of the nicest people you’ll meet as well! Great atmosphere, super friendly staff, excellent food. Will definitely be back! So good! I’ve had the food truck and been back to the spot in City Market multiple times. It’s a great spot (adorable tables, great art, Brazilian music) but the food is downright crave worthy. Get the Coxinha (Co-sheen-a) with the chimichurri sauce and their updated Porcao sandwich (as of March 2018). Already ready to come back again…!